Model Train, Life-Like, 1 lb. of White Gravel. We recently acquired a large N scale train collection. Here is a 1 lb. 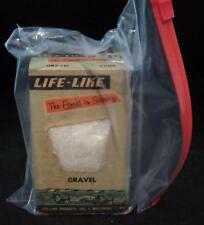 Box of Gravel from Life-Like Products. FREE Trial! We will normally get back to you within 24 hours. CLASSIC METAL WORKS 1160 N SCALE 53 FORD COUNTRY SQUIRE WAGON WOODSMOKE GRAY #50319. NEW. CHECK OUT OUR STORE FOR MORE GREAT BUYS AND WE ALWAYS COMBINE SHIPPING. 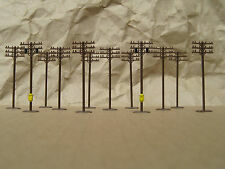 (2) Model Power - N scale 3-Way Traffic Light - #8562 - MIP!!! (2) Model Power - N scale - 3-Way Traffic Light #8562 - both mint in package!!! - Please see all pics and all our other auctions! 2 different shades of green. Any scale modeling project. Bags are open, but very little was used from either of them. Ready Made Realistic Deciduous Trees. Classification: Trees - (3/4 in. Ready to plant on any layout. Checking Out! Train Sets Only will help you resolve issues with the manufacturer when necessary. ). Micro Engineering. Kit needs to be assembled and painted. The Poles are 2-1/4" High. 12 Pieces. 2 of which have yellow signal boxes. 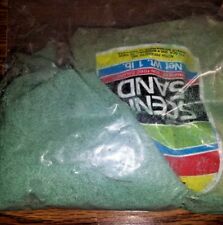 See photos of actual item. What You See Is What You Get. Walthers #933-3289 Brick Smokestacks pkg of 2. N Scale Brick Smokestacks new. Item: #7013. Up for your consideration is an N scale. The set is unopened and in excellent condition. It is molded in colored plastic. Stacked Tires 7 pieces. Micro Engineering. Kit needs to be assembled and painted. Perfect to enhance the appearance of your model landscape with a touch of greenery. 40 Pieces 1:150 Scale Model Trees. - The tree color is bright and beautiful. Tree Height: Approx. - Scale: 1/150. Perfect to enhance the appearance of your model landscape with a touch of greenery. Tree Height: Approx. 40 Pieces 1:150 Scale Model Trees. - Scale: 1/150. Size Chart - Material: Plastic. - The tree color is bright and beautiful. Perfect to enhance the appearance of your model landscape with a touch of greenery. - Scale: 1/200, 1/250; Suit for N gauge (The standard HO O N class is 1:87,1:48,1:160. 1:250 is suit for N class). Made by Bachmann (Item #42506). I will send you your combined invoice directly. Perfect to enhance the appearance of your model landscape with a touch of greenery. Tree Height: Approx. Type: Model Trees. 40 x Model Trees. - Scale: 1/150. Size Chart - The tree color is bright and beautiful. Perfect to enhance the appearance of your model landscape with a touch of greenery. - Scale: 1/150. Size Chart 10 Pieces Model Trees. Perfect to enhance the appearance of your model landscape with a touch of greenery. 40 Pieces 1:150 Scale Model Trees. - Scale: 1/150. Size Chart - The tree color is bright and beautiful. - Color: Green. Perfect to enhance the appearance of your model landscape with a touch of greenery. - Scale: 1/150. Size Chart 20 Pieces Model Trees. Price for all:£4.88 You save£3.27. Quantity: 80pcs. - Perfect to enhance the appearance of your model landscape with a touch of greenery. Height: Approx. 80 Pieces Green Model Trees. - Scale: 1/250; Suit for N gauge (The standard HO O N class is 1:87,1:48,1:160. ). Perfect to enhance the appearance of your model landscape with a touch of greenery. 40 Pieces 1:150 Scale Model Trees. - Scale: 1/150. Size Chart - Material: Plastic. - The tree color is bright and beautiful. Perfect to enhance the appearance of your model landscape with a touch of greenery. 20 Pieces Model Trees. - Scale: 1/150. Size Chart. Perfect to enhance the appearance of your model landscape with a touch of greenery. 10 Pieces Model Trees. - Scale: 1/150. Size Chart. Quantity: 16pcs(per 4pcs for one size )- Scale and Height (Root Included):Approx. - Perfect to enhance the appearance of your model landscape with a touch of greenery. 16 pcs model trees(per 4pcs for one size ). Perfect to enhance the appearance of your model landscape with a touch of greenery. 40 Pieces 1:150 Scale Model Trees. Jewelry Findings |Health & Beauty |Wedding Decoration |Sports and Outdoors |Jewelry & Watches |Clothing, Shoes, Accessories |Other. Perfect to enhance the appearance of your model landscape with a touch of greenery. - Scale: 1/250; Suit for N gauge (The standard HO O N class is 1:87,1:48,1:160. 1:250 is suit for N class). Height: Approx. Great collectibles. Perfect for model train set landscape. Paints are non-lead based and not toxic. Just enjoy them. Well painted, assorted colors and styles. Scale: 1:150. People always bought together with. Quantity: 10pcs. - Tree branches can be altered to desirable shape. - Gauge: 1:150 - 1:200. - Scale: N Z. - Color: Green. Perfect to enhance the appearance of your model landscape with a touch of greenery. 10 Pieces Model Trees. - Scale: 1:150. Size Chart. Perfect to enhance the appearance of your model landscape with a touch of greenery. - Scale: 1:150. Size Chart 10 Pieces Model Trees. Tree Height: Approx. - Perfect to enhance the appearance of your model landscape with a touch of greenery. 40 Pieces 1:150 Scale Model Trees. - Scale: 1/150. Size Chart - Material: Plastic. - The tree color is bright and beautiful. Perfect to enhance the appearance of your model landscape with a touch of greenery. 20 Pieces Model Trees. - Scale: 1/150. Size Chart A 3-year warranty is promised, your satisfying is our ultimate pursue.